The U.S. sanctioned ZTE for trade agreement violations and concerns about spying, but President Trump wants to help it out. 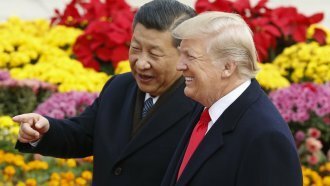 President Donald Trump told reporters Tuesday he's looking at helping a sanctioned Chinese tech company "as a favor" to Chinese President Xi Jinping. "As a favor to the president, I am absolutely taking a look at it," Trump said in the Oval Office before a meeting with South Korean leader Moon Jae-in. The Commerce Department banned American companies from selling parts to ZTE after it violated sanctions on Iran and North Korea and then misled the U.S. government. "But it's also a phone company that buys a large portion of its parts that make up these phones that are sold all over the world from American companies," Trump said. "So when you do that, you're really hurting American companies, also." The Trump administration also barred ZTE from selling its products on American military bases after the Pentagon expressed concern the company would be able to use its devices to spy on U.S. armed forces. Earlier this month, the House Appropriations Committee added an amendment to the Commerce Department's proposed budget that would keep it from lifting that ban on American companies selling to ZTE. That was a clear and bipartisan break with the president.